What goes into Afghani cuisine? Spices: spices not only add flavor, brightness and sharpness to the meal, but also come with good health benefits. Spices include cardamom, cumin, turmeric, cloves and saffron. Cardamom: Is widely used in sweet and main dishes. They are rich in vitamins like vitamin-C, riboflavin and additionally rich in iron, magnesium and potassium which is good for overall health. Turmeric: Traditionally known for its medical properties, this spice is used in many Afghani recipes for flavor and color. Saffron: Saffron, being highly priced among the other spices is still widely used in rice based foods and also in puddings. A small amount of saffron is enough to do the trick! Breads: Among most staple foods around the world, bread is the oldest known one. Bread is a wonderful source for iron, vitamins, calcium and protein. However, if they are made of whole wheat, the benefits are doubled. Cereals: Afghani cuisine is rich in wheat, rice, barley and maize. A combination of different cereals helps to provide them with a variety of nutrients. Meat: Lamb, chicken and camel meat are some of the forms of meat eaten by them. Shellfish and pork is not included according to their Islamic culture. Eating in abundance demonstrates Afghani culture and one's enjoyment. Due to varied climatic conditions, a wide variety of crops are grown here. 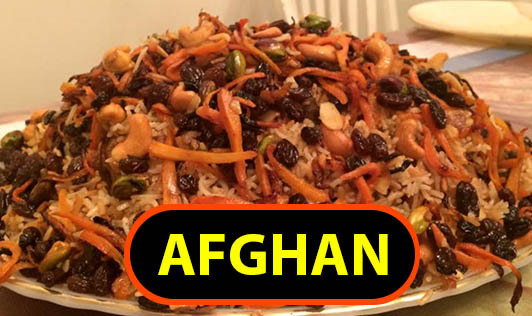 Rice is the main dish in Afghani cuisine. Plenty of time and effort goes into preparing their rice dishes. A meal never starts without a salad. A major portion of protein in the meal comes from lamb. The best part of Afghani cuisine is that Afghanis bring out the best recipes with any vegetables. There are few predominant flavors in Afghan cuisine like orange peel, cardamom, rosewater and saffron. Qormas and Shormas are common forms of soups that are very popular among the Afghanis. Fresh fruits are eaten during the day or as a dessert. Eggplant is the staple vegetable. Onion, spinach, turnip, potatoes cauliflower and beans are also widely used. Yogurt is used as both a sauce in main dishes and as a side to compliment dishes. A wide variety of breads are used like naan, lavish naan and obi naan. Most of the bread varieties are mainly made of Maida. This could be made healthier by choosing whole wheat flour in these recipes. There is not much importance given to cutlery. Afghans use the right hand to eat and food is shared by all the family members at meal time. The common drink in Afghanistan is tea. Afghan meal is typically finished off with tea or chai. From a health stand point, consuming tea after a meal may not be a good choice as tea might interfere with the body's ability to absorb iron. To conclude, in terms of health, though this cuisine offers a good variety of cereals, vegetables, fruits and meat products, overdoing any of them may not be a sign of good health. The spices and herbs used in this cuisine offer good health benefits that we can incorporate in our cooking methods.